IF THERE EVER WAS COLLUSION AND OBSTRUCTION OF JUSTICE, LOOK NO FURTHER THAN OBAMA’S FORMER AG, LORETTA LYNCH. During the Senate Judiciary Committee with former FBI director James Comey we learned there was actual collusion and obstruction of justice; however, it has nothing to do with the Trump administration, it was with the Obama one. On Friday, the Senate Judiciary Committee leaders said they are seeking information about former attorney general Loretta Lynch’s alleged efforts to stifle the FBI’s investigation of Hillary Clinton’s use of a private email server while Clinton was secretary of State. Yeah, that little investigation that Lynch wanted FBI Director Comey to call a matter. Comey testified, “When I said, we have opened a matter, they all reported the FBI has an investigation open. And so that concerned me because that language tracked the way the campaign was talking about FBI’s work and that’s concerning.” However, in the end Comey had no problem doing what she said. Hmm, no notes taken and no obstruction of justice decided by Comey. Imagine that? Via RedState, in a interview on CNN’s ‘State of the Union’ Senator Dianne Feinstein (D-CA) said that there should be an investigation into former Obama administration Attorney General Loretta Lynch’s actions that came out during former FBI directors testimony last Thursday to the Senate. Comey testified that Lynch improperly injected politics into the investigation. Comey was told to call the FBI criminal investigation a matter. However, in that case, Comey had no issue doing exactly what the AG told him to do and provided cover for the Hillary Clinton presidential campaign. Although now he claims it gave him a queasy feeling. It’s not every day the ranking member of the Senate Intelligence Committee says a political appointee of the same party needs to be investigated. But that’s exactly what Democratic Senator Dianne Feinstein (Calif.) said on Sunday’s State of the Union on CNN of former Obama administration Attorney General Loretta Lynch’s actions in regards to the Clinton email scandal. This Sunday on Meet the Press, Senate Intelligence Committee Chair Dianne Feinstein called Barack Obama a ditherer in dealing with ISIS. Host Andra Mitchell asked, “The fact is, they have been on the march now for months, if not years. So why does the president still say we don’t have a strategy yet? The Democrat Senator from California Feinstein’s exact response was, “I think I’ve learned one thing about this president, and that is he’s very cautious. Maybe in this instance, too cautious.” In other words, a ditherer. ditherer – noun: a person who dawdles or is indecisive, pictorial definition, see Barack Obama. ANDREA MITCHELL: The fact is, they have been on the march now for months, if not years. So why does the president still say we don’t have a strategy yet? Doesn’t that project weakness from the White House? DIANNE FEINSTEIN: Well, I mean, I know what you want me to say. But I’m not going to say it in that sense. I think I’ve learned one thing about this president, and that is he’s very cautious. Maybe in this instance, too cautious. I do know that the military, I know that the State Department, I know that others have been putting plans together. And so hopefully, those plans will coalesce into a strategy that can encourage that coalition from Arab nations, Jordan’s at jeopardy, Lebanon’s at jeopardy, the UAA and other countries are in jeopardy. So there is good reason for people to come together now and begin to approach this as a very real threat, that it in fact is. ANDREA MITCHELL: The president back in January told The New Yorker magazine, David Remnick, that ISIS is the JV team. That was clearly wrong. DIANNE FEINSTEIN: Well, I think it’s wrong too. I think it’s a major varsity team. And if you want to use those kinds of monikers. But I see nothing that compares with its viciousness. I’ve been on the intelligence committee now since before 9/11, and I’ve watched this evolution of non-state actors into world terror very carefully and closely. According to a declassified CIA inspector general’s report as reported by ABC News, CIA officers improperly accessed Senate computers, read the emails of Senate staff, and exhibited a “lack of candor” when interviewed by agency investigators. CIA Director John Brennan apologized to Senate Intelligence Committee leaders for the CIA’s conduct, which was quite a a turnabout for the CIA directors previous comments that the CIA did anything wrong. Yup, no separation of powers scandal here. The document, released Thursday by the CIA, is a summary of an internal CIA investigation that prompted CIA Director John Brennan to abandon his defiant posture in the matter and apologize to Senate Intelligence Committee leaders. The inspector general concluded “that some CIA employees acted in a manner inconsistent with the common understanding reached between” the Senate Intelligence Committee and the CIA in 2009 regarding access to a shared classified computer network, Boyd said. The shared network had been used by Senate aides to access classified files on CIA interrogations. The CIA penetration occurred after the aides got a hold of documents that the CIA claimed were internal, but which showed that some CIA officials shared misgivings about the treatment of al Qaida detainees. Central Intelligence Agency officers snooped on computers used by a Senate committee investigating the CIA’s interrogation program, an internal agency report has concluded—a critical finding in a bitter standoff between two government branches. CIA Director John Brennan apologized to key senators, who were briefed this week on the CIA inspector general’s report, the agency said on Thursday. The finding bolsters allegations by Sen. Dianne Feinstein (D., Calif.), the Senate intelligence committee chairwoman, who has denounced what she described as a CIA search of Senate computers that may have violated the Constitution’s separation of powers and Fourth Amendment protections against unreasonable searches. The CIA declined to comment on Mr. Udall’s call for Mr. Brennan’s resignation. Five CIA employees, two attorneys and three information-technology staff members “improperly accessed or caused access” to the special network, according to a declassified summary reviewed by The Wall Street Journal. Those efforts included falsifying identities to get on the Senate network, reading emails and taking screenshots, said an official who read the inspector general’s report. REMEMBER WHEN BRENNAN SAID THE FOLLOWING REGARDING HACKING INTO SENATE COMPUTERS? UPDATE I: Two Democrat Senators, Chairwoman Dianne Feinstein and Mark Udall call for Brennan to Resign. Two Democratic senators demanded that Central Intelligence Agency Director John Brennan resign on Thursday after revelations that the CIA snooped on Senate computers. Administration officials briefed the Senate Intelligence Committee’s membership on Thursday afternoon about an inspector general report that revealed CIA officials improperly accessed computers used by Senate staffers to research a 6,700-page report on the agency’s Bush-era interrogation and detention practices. “At this point it would probably be better for the agency, frankly, if he did step aside. I think that the level of trust between the committee and the director has hit a new low,” Heinrich told reporters. He said he had not spoken to Brennan recently. “I have full confidence in John Brennan,” Obama said in response to a reporter’s question at the end of an afternoon press conference. UPDATE II: Obama remains confident in CIA head John Brennan despite Senate spying. 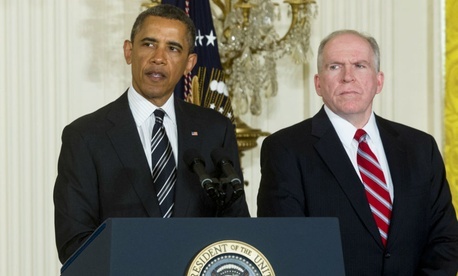 President Obama remains confident in CIA Director John Brennan’s leadership despite an independent investigation that concluded that the agency had overreached its authority by spying on Senate staffers. White House spokesman Josh Earnest said the findings had not diminished Brennan’s standing in the administration. Brennan first appointed an outside watchdog to conduct an investigation into the allegations, has “been candid” about the “inconsistencies” that the inspector found, apologized and took the step of appointing a panel to review the need for disciplinary action, he said.